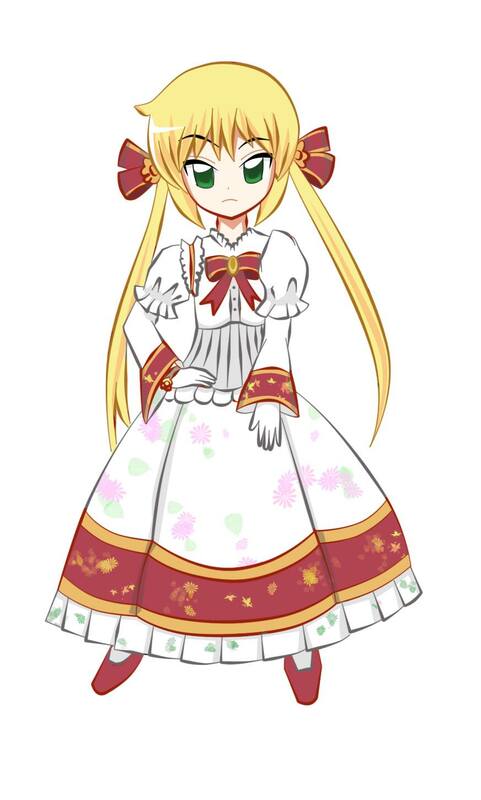 I would much rather prefer to blog about Nagi ALL THE TIME... but you know, there are some things that I just can't let slide, and this incident is one of them. 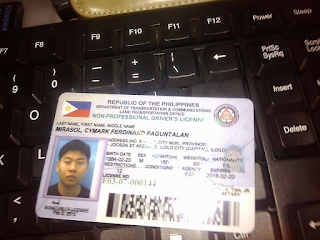 Here's the scenario: I had my driver's license processed for the printing of a new permanent license card at LTO Robinson's Iloilo Branch around two weeks ago counted from the date of this blog post. 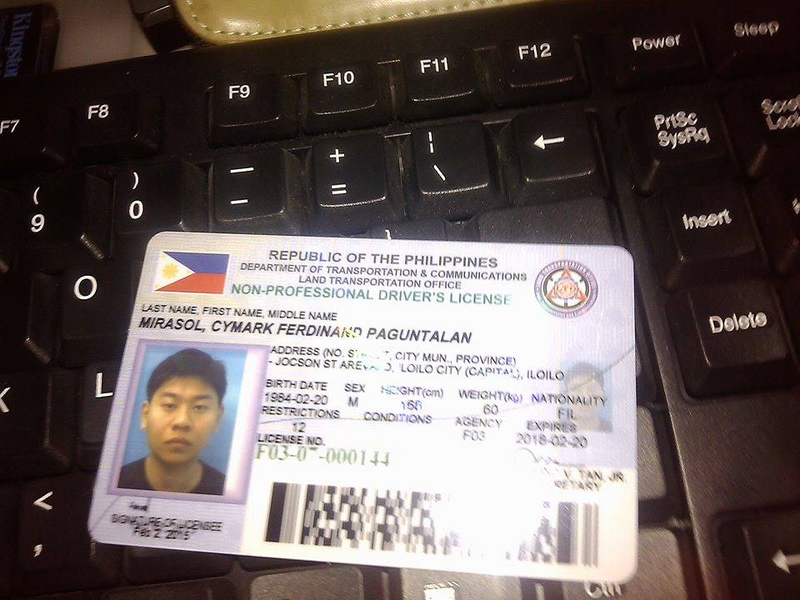 Since I had already processed everything for renewal way back in February, all I had to do was submit a photocopy of the temporary license they issued me back then -- which was basically a flimsy piece of paper that serves as a valid driver's license. They told me to come back next week (which was last week), but I didn't have time until today. So today, I went to Robinson's at around 10:00 AM and I found that there was already a long queue in front of the LTO office. So when it was my turn in front of Window 6, the releasing officer, she told me to leave my permanent license with her and to come back at 11:30 because my license had not been printed out just yet. 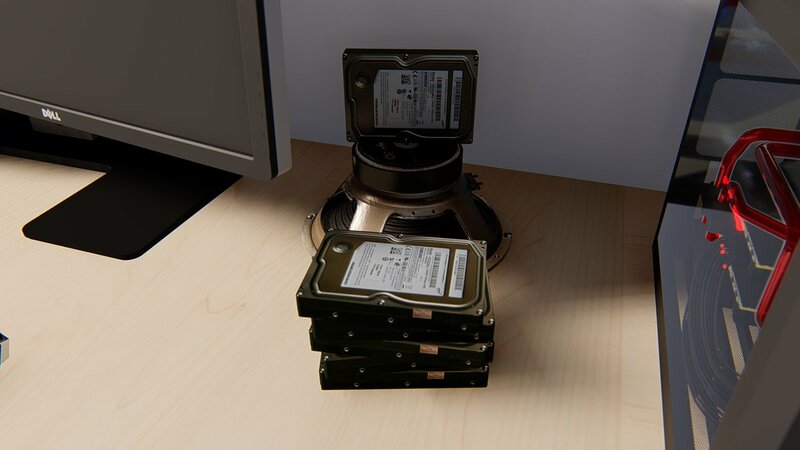 So I was like, "ok, that seems reasonable." I was already on my way out when I heard the guy from window 1 suddenly declare "Indi kami ka print lisensiya subong. Guba ang printing machine. (We cannot print any licenses today. The printing machine is broken.)" So this alarmed me and I immediately walked back to window 6 to ask what I was supposed to come back here for at 11:30. The releasing officer then reassured me that I would get my permanent license at around that time. I came back at 11:45 and the queue was longer than ever. Fortunately, when it was my turn at window 6 again, I finally received my permanent license card without a hitch after being made to sign some kind of release quota list. Then, just after I'd received my card, again, someone from inside the office announced to everyone that, "Wala kami di printing ka license subong. (We don't print licenses right now)"
Okay... doesn't something about that seem sketchy to you? The contradiction between how I got my license card printed just today and the declarations of the LTO staff to the people at large who were just about to process their licenses today just seems too big for me to let slide. I just want to know: what exactly was going on in there today? Were the LTO staff being purposely deceitful? I know for a fact that my license card was printed today, but this is totally contradictory to their declaration that they cannot print any licenses until December. If anyone who is legally empowered to look into this matter is reading this: please investigate this incident. I'm pretty sure this has become common practice for the LTO since I had to come back every 2-3 months to check up on whether they could print licenses or not and without batting an eye, the customer service representative told me to come back in the next two months -- this had been going on since March and I finally just received my license today. Synopsis: Awright... real quickly, Hayate unleashes his trump card -- as correctly predicted by some smart person on the internet who is not me. He channels his bad luck to gain an advantage in the game of Reverse Old Maid. 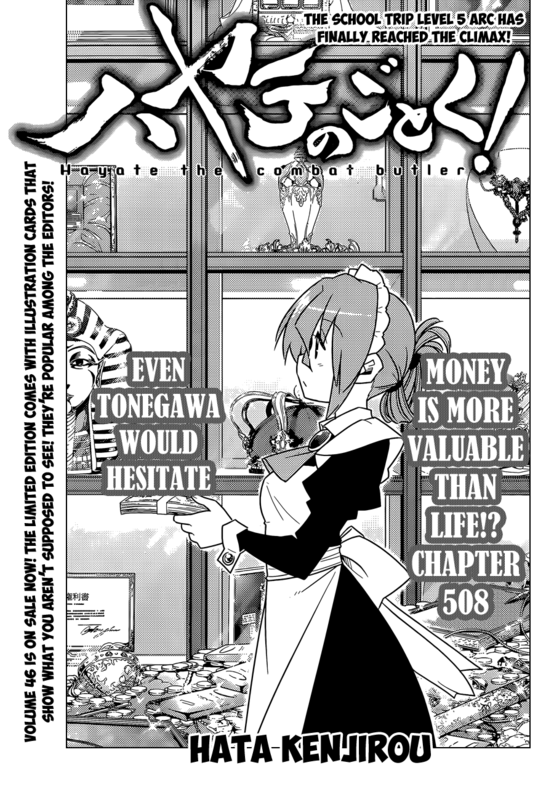 Everyone else follow suit, but eventually, it all boils down to Hayate vs Hina. 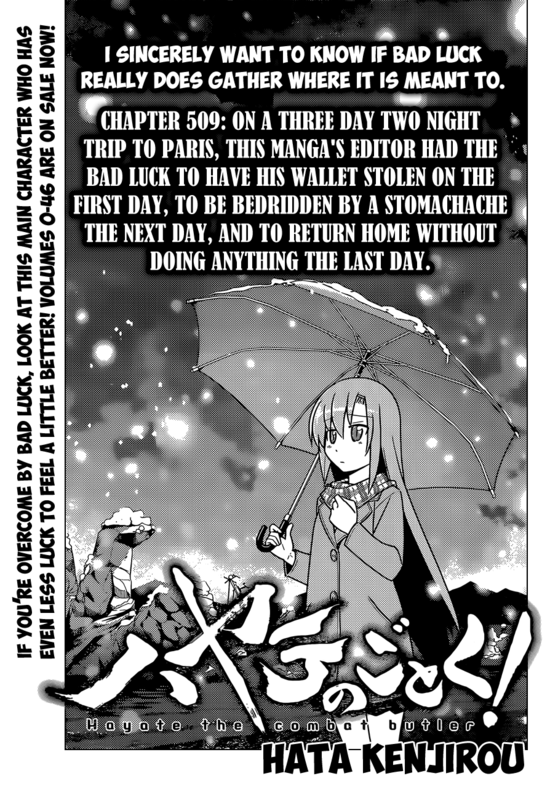 Hina's final claim at "bad luck" is that the guy she likes won't ever notice her feelings, but eventually, it seems Hayate has won.. or so it seems. Cliffhata time! Don't think she's actually lost just yet. 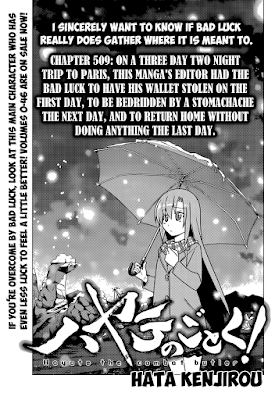 This could have gone the other way based on ths cliffhanger... and Hata's track record. Review: Hmm... interesting chapter, but still no sign of mai waifu... so meh! This looks like it might be the penultimate chapter to end the Level 5 arc -- as it's known in the manga. Still, there are quite a few things unresolved such as Ruri Tsugumi's involvement, as well as what's going on with Nagi? 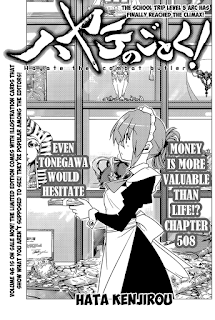 I don't buy for one moment that she just up and gave up on the competition since as I've mentioned before, it's "Hayate's life" and not the 150 million at stake for her. Anyway, I guess there's room to throw out some wild speculations here. Speculation Corner: Let's see... Hina's lose isn't enough to produce an explosion of negative emotions. 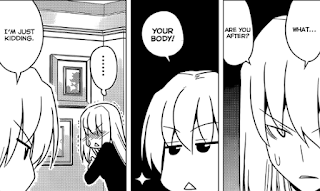 She decides to confess to Hayate. 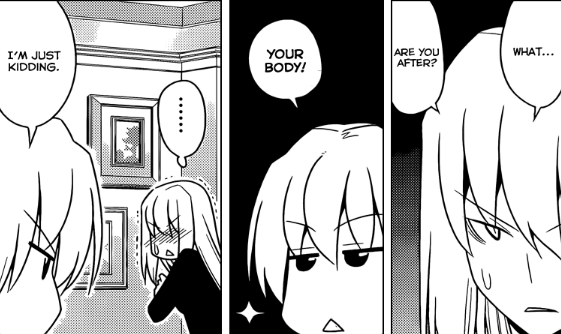 Hayate is about to accept or does accept when Nagi storms in -- boom! Explosion of negative emotions. Final arc staaato! I think this is consistent with the developments under chapter 413/Nagi finding Hayate hugging Ruka from behind and promising her happiness moment since I do not believe that event was really resolved. Now there is a lot of room here to interpret the final panels of this chapter, but all of my interpretations might sound offensive to other shippers, so I shall refrain. It can also be interpreted in a positive way for Hina anyway. Fanart Corner: Had time to finish that request before this chapter was out. Kudos to RHS for getting this one out early. Lady Wedge's outfit from Ayakashi Ghost Guild... whatever that is. Synopsis: Hayate blackmails Kananiwa into letting him decide what the final orientation would be since he has a recording of her collaborating with those wannabe terrorists. Also, she's just 28. Wait... I'm older than her? Umm... nevermind... moving on. 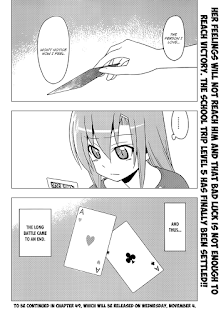 So Hayate calls up everyone except Nagi (who is still fast asleep) and has everyone play cards in order to decide the winner -- since it's Las Vegas and all. 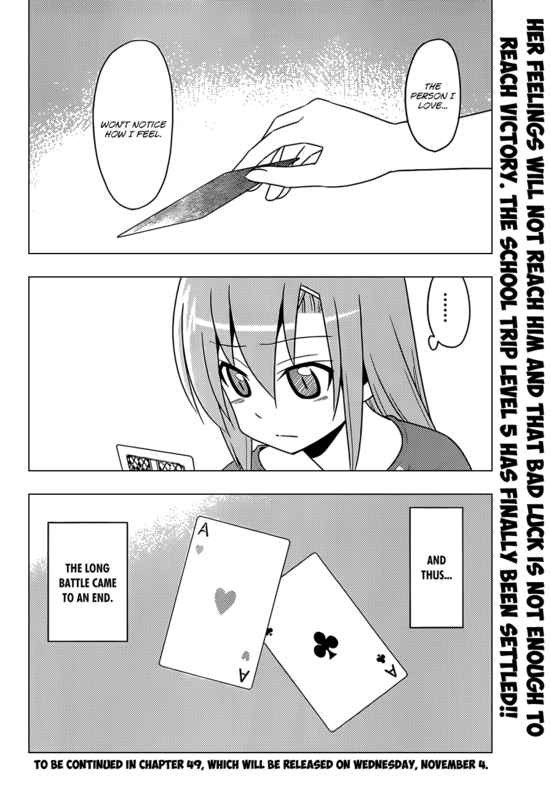 Anyway, Izumi has an awesome poker face and Hina's good at everything... including cards. She declares that she CAN NOT LOSE! Anywayz... end of chapter. Am I the only one who likes Kananiwa? 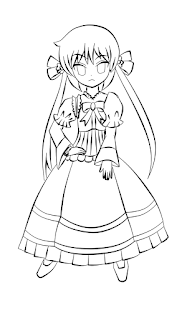 I think I'll do some Kananiwa fanart next time. Btw, this scene is totally doujin bait. Review: After last week's excitement, things are moving slower in this chapter. I guess that "there is a bomb between them" thing was just a setup for something that'll become important later... or buried in obscurity. 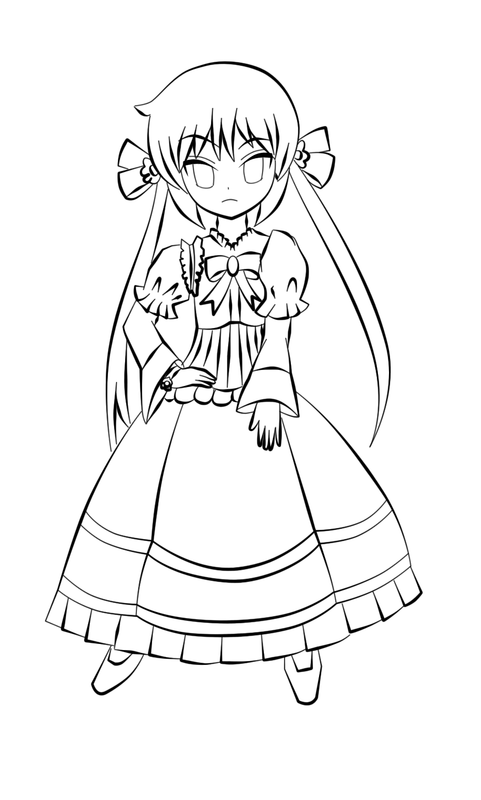 Classic Hata style. 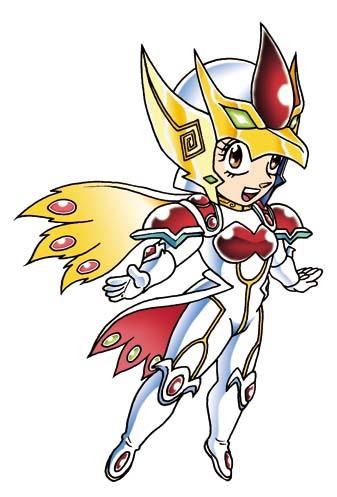 Also, mai waifu is not present so Iyam disappoint. Also, once again, Hayate affirms Nagi's "amazing luck," while Hayate himself has terrible luck... no, I'm totally NOT implying anything here ;). 1. Why'd he choose a game of chance? He either wants to lose really badly or he's got a fail-safe plan for winning -- and he'll still lose anyway. 2. Why is he interested in Kananiwa's King's Jewel and why did he ask her to participate? Anyway, with that aside, let's move on to the next chapter in a hurry, shall we? Not even interested in guessing who is being hinted at in the cliffhanger. Hata might just decide that it's time to bring in Ruri Tsugumi again. Fanart Corner: This one is a request. 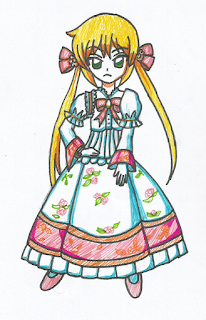 It's not quite finished yet, but the colored pens version has color at least. Iloilo City: How Far Have We Really Gone? So while having the car serviced at the Jaro Nissan Service Center, I took a little (long) stroll from Gaisano City to SM City cutting through the Iloilo Sports Complex Road. Started at 9:37 and arrived around 10:08. Anyway, as I took the overpass towards the entrance to SM, I noticed that there was an old beggar lady at the bottom of the overpass on the side of the Injap skyscraper. Not the least bit winded from the trip (because I have teh awesome cardio), the contrast of visual information struck me as a little bit sad; the Injap skyscraper, 7-11, Apec 2015 signs, a relatively brand new overpass and a pitiful looking beggar woman at the bottom of the overpass. I thought about donating some of my loose cash to her, but I didn't. At the end of the day, I wouldn't be helping her -- I wouldn't be saving her from doing the same thing again. Giving alms at that moment would just be plain hypocrisy. I'd just be making myself feel better-- staving off the vague moral obligation compelled by this sight. There was realistically nothing that I could do for this person at that very moment -- except perhaps to let others know so that they may know. I'm not noble nor pure-hearted, but I can't help but feel that there's just something wrong with this scenario. Iloilo City is obviously investing millions into infrastructure development and yet, the presence of such a sight feels (to me) like a failure on the side of social welfare and the delivery of basic goods and services. What do you think? Was this a one-time fluke? Could we stand to rethink our priorities a bit?